Why Did Mirziyoyev Fire an Uzbek Deputy Prime Minister? Mirziyoyev apparently has little tolerance for demeaning treatment. A photo of six men knee-deep in a water-filled ditch, their heads bent, in submissive postures hit the internet not long after it was taken on October 25. The photo jolted Uzbekistan’s social mediasphere. As discovered later, the incident took place in Oqqurgon, one of 14 districts of Tashkent Region. Zoir Mirzaev, deputy prime minister overseeing agriculture and irrigation, was the highest official visiting the area when the incident took place. 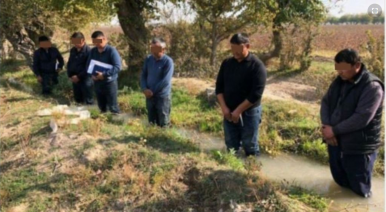 The men in the ditch turned out to be Oqqurgon’s regional officials and local farmers, who were being punished for failing to meet an irrigation deadline. Four days after the incident, Uzbek President Shavkat Mirziyoyev fired Mirzaev in relation to his presence at the Oqqurgon incident, plus shortcomings in countrywide wheat growing and irrigation. Although the president’s announcement contained no references to the incident as such, he equated Mirzaev’s act to forced labor. To amplify the seriousness of the matter, Prime Minister Abdulla Aripov held a separate meeting in which he accused Mirzaev of participation in the incident. Overseeing agriculture and irrigation is no small appointment in Tashkent considering the large number of Uzbeks engaged in agricultural activities. Mirziyoyev himself was responsible for the sector when he served as prime minister. In addition, Mirzaev held the mayorship of Samarkand region that Mirziyoyev once held. Therefore, Mirzaev was almost certainly hand-picked by the president himself for the post, which he took up shortly after Mirziyoyev’s December 2016 election. The fact that he clung to his seat for two years, a long period to maintain a public office under Mirziyoyev, demonstrates high trust he had gained. While the swift reaction to the incident by both the president and prime minister was unexpected, the incident itself and the circumstances around the incident were not. Although a year ago Mirziyoyev announced that denigrating treatment of subordinates is against state and presidential policy, mistreatment in public offices remained as widespread as before. In fact, around the time of the Oqqurgon event, a photo of another group of six men holding heavy rocks, also possibly as an act of punishment, hit the internet. Earlier, the mayor of Andijan city was caught in a video beating local school principals. The Oqqurgon incident thus demonstrates three things. First, the pervasive nature of a contemptuous attitude by Uzbek officials toward their subordinates. Public workers falling under their superior’s wrath pass the same treatment to their subordinates and the chain of mistreatment continues downward. Second, president’s prompt reaction to the incident indicates an acute sensitivity to the issue. Rather than aiming to placate the social media masses — reacting to the incident’s viral nature — Mirziyoyev reacted because the incident personally offended him. In contrast, when social media similarly flared up three months ago over the ban of religious clothing at schools and the loudest social media users were arrested, neither the president nor any other senior government member reacted. This suggests that the motivating factor this time is not the viral nature of the public outcry but the specific issue itself. Third, the public sacking of Mirzaev demonstrates Mirziyoyev’s seriousness about the issue of officials meting out demeaning treatment. Mirzaev’s sacking was announced by both the president and the prime minister. Rather than letting Mirzaev go quietly, the public firing was staged to send a strong message to public servants about the president’s acute attention to this issue. The quick turnover of officials in Uzbekistan has become the norm since the change of the government in 2016. Officials are transferred, demoted, or sacked with regularity. Although the latter happens often in lower levels of public service, such as regional leadership, it is a relatively rare scene among senior officials who work closely with Mirziyoyev. Mirzaev’s sacking was the first instance when a senior official was sacked in such a public manner. The president seemingly has a soft spot for demeaning treatment; thus, the swift reaction. Nevertheless, not every single similar case will continue receiving the president’s attention, leaving the question of a long-term cure for abusive officials open. There are better responses than repression or radicalism to points of friction in Uzbek society.